MOORESVILLE, N.C. – Even with his nearly four-week sabbatical coming to an end in NASCAR K&N Pro Series East (NKNPSE) competition, Tyler Dippel (@tyler_dippel) rides the momentum of a successful stint in the ARCA Racing Series presented by Menards towards a weekend of double-duty racing between the two series. From Saturday afternoon’s K&N Visit Hampton Virginia 150 at Langley (Va.) Speedway to Monday’s ARCA Labor Day thriller General Tire Grabber 100 on the DuQuoin-mile dirt, the NASCAR Next alumnus is ready to embrace the busy schedule and succeed. 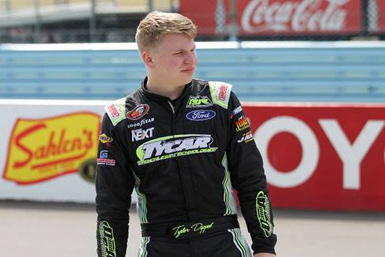 Knowing that his Rette Jones Racing (RJR) team has had the speed on the K&N side, the Wallkill, New York native is eager for the team to accelerate that speed to performance in his Langley debut. On the flip side, Dippel relied on his dirt track expertise in an ARCA car a few weeks ago at the Illinois State Fairgrounds to pay off. In his second ARCA start of the year, the New Yorker battled to a hard-fought and career-best third place finish driving the No. 33 Toyota Camry for AM Racing’s development partner Win-Tron Racing in a collaborative effort with RJR. This weekend, the teenager believes he can contend for wins in both series. “It’s not going to be an easy weekend, but we’re prepared for it,” said Dippel. 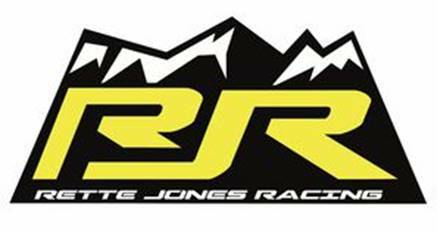 “I can’t say enough about this Rette Jones Racing team. They have been busting their tails trying to get two different types of cars ready for me. We expect to be good at both. I’ve never been to Langley in an K&N car, but I think my crew chief Mark (Rette) has a good baseline for where we need to be. Wedged inside the top-10 in the championship standings with just three races remaining on the K&N schedule at Langley, New Jersey Motorsports Park and Dover (Del.) International Speedway, Dippel wants his final month of K&N racing this season to end on a high note and produce his second-career K&N victory. Rette, who serves as Dippel’s mentor in addition to his car owner says his driver has never been more determined, especially since the Herr’s Potato Chips 100. “Even though it was a dirt race, Tyler wheeled that car at Springfield,” recalled Rette. “It proved that if everything goes the way it’s supposed too, he can get the job done. For Langley, we’re bringing one of the very best cars in our fleet and for DuQuoin, it’s the same beast he drove to third at Springfield. Through 11 K&N races this season, Dippel, driver of the No. 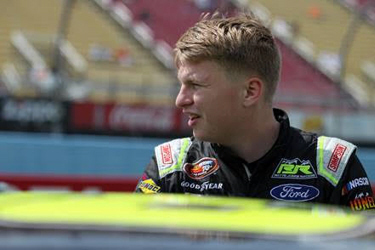 30 TYCAR Trenchless Technologies Ford Fusion sits ninth in the championship standings, four points behind eighth-place runner Dillon Bassett. In 25 career NASCAR K&N Pro Series East starts, Dippel, 17, has earned one victory (Mobile Speedway, 2016), achieved two top-five and 12 top-10 finishes. The teenager has also 139 laps led in event competition. The Visit Hampton Virginia 150 (150 laps / 59.4 miles) is the 12th of 14 races on the 2017 NASCAR K&N Pro Series East schedule. Practice begins for the one-day show on Sat., Sept. 2 from 3:00 p.m. – 3:55 p.m., with final practice set from 4:10 p.m. – 4:45 p.m. Group qualifying is set for later in the day at 7:00 p.m. The race will take the green flag just after 9:00 p.m. that night. The event will be televised on a tape-delayed basis on NBC Sports Network with an air date on Thurs., Sept. 7 at 7:00 p.m. ET. The General Tire Grabber 100 (100 laps / 100 miles) is the 16th of 20 races on the 2017 ARCA Racing Series presented by Menards schedule. Practice begins Monday, Sept. 4 with a one-hour practice session planned from 10:45 a.m. – 11:45 a.m. General Tire pole qualifying is set for later in the day at 12:30 p.m. The race is set to take the green flag shortly after 3:00 p.m. The event will be tape-delayed on MAVTV, while ARCARacing.com will stream live timing and scoring throughout the day’s activities. All times are local (CT). For more information on Tyler Dippel, please check out TylerDippel.com, his Facebook page (Tyler Dippel Racing) or on Instagram @tylerdippel. Dippel tweets too. Follow him @Tyler_Dippel.